I currently use three different planners- two for my personal life and one for work. 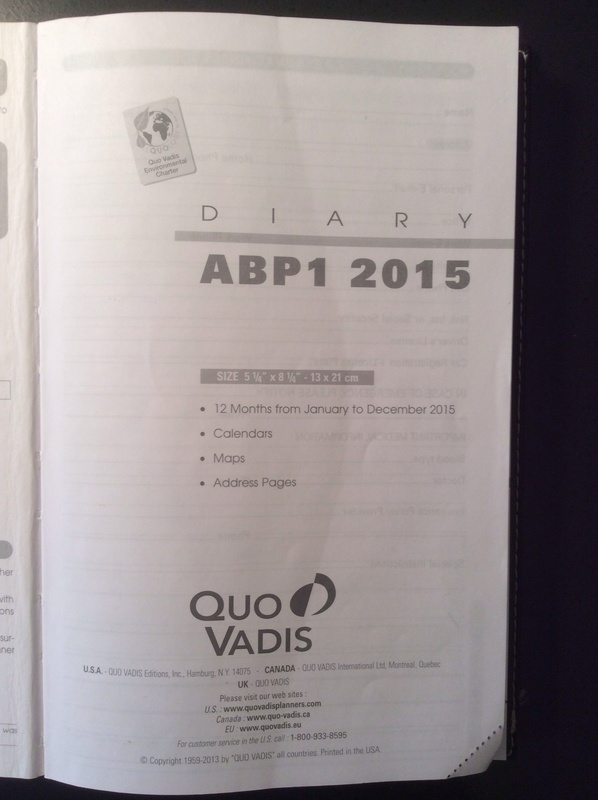 Today I’m going to offer a review of my work planner- the gorgeous yet practical ABP1 made by Quo Vadis. I’ve used an ABP1 as my work journal the last two years and have found it well-suited to my needs. With its pleasing, clean layout and high degree of functionality, the ABP1 will be my work planner choice for years to come. The ABP1 is a daily planner that measures 5 1/4″ by 8 1/4″ – large enough to be useful, yet compact enough to be portable. The planner boasts smooth 64g white paper which is a delight to use. 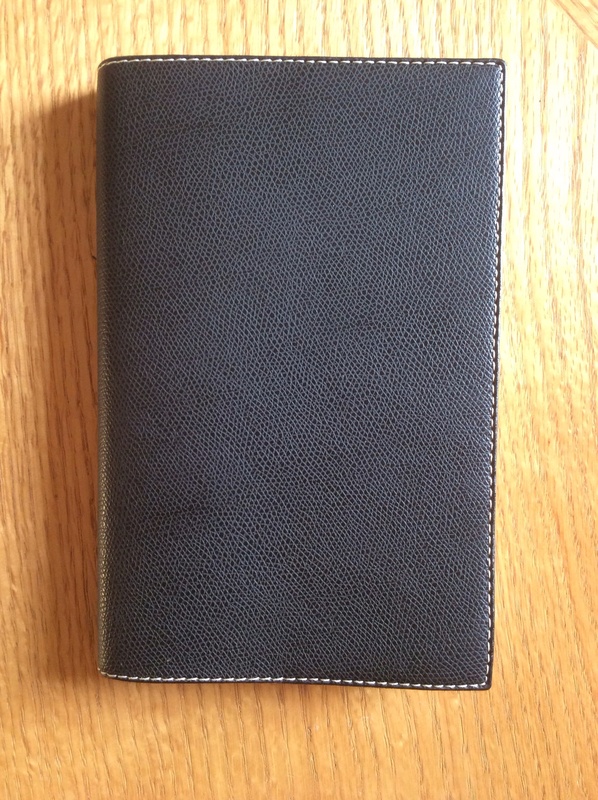 And as with almost all Quo Vadis planners, the ABP1 has a sewn binding that lays flat when open- which is essential. Sections in the planner include a personal information page, annual planning calendars, a slew of maps, and an address section at the back. The volume has a nice heft and balance and feels right in the hand. Now lets take a tour of the daily planner page itself. 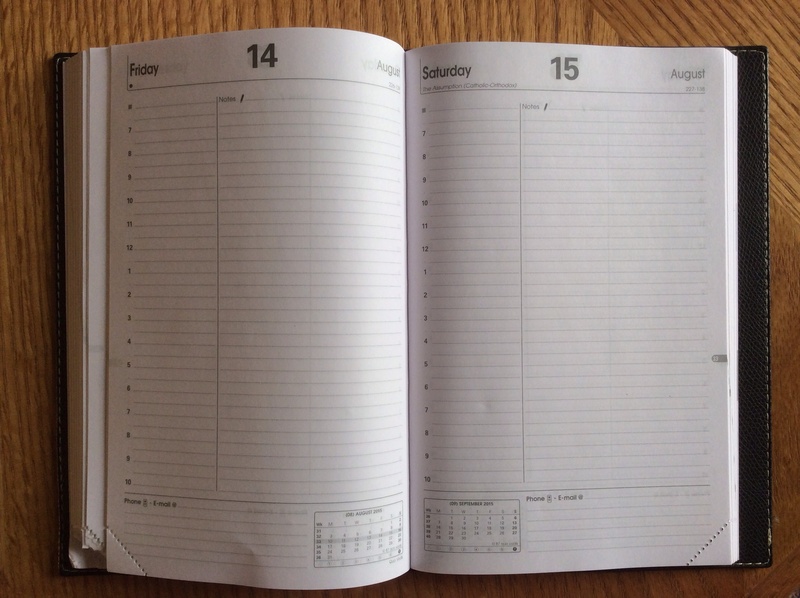 As I’ve said before, the layout is clean and aesthetically pleasing and, most importantly, very practical, perhaps the most useful layout I’ve encountered in a planner (and over the years I’ve tried many a planner format). As you can see in the image above, the page is divided into three main sections- a narrow timed column to the left, with a larger open format notes section comprising most of the page. A smaller notes/email section appears at the bottom of the page along with small monthly calendars. Line width I’ve measured to be approximately 5mm, which I find to be nearly perfect. And if you look closely, you’ll see that the bottom corners of each page are perforated- simply tear away the corners to mark you place as you progress though the year. While I wasn’t particularly fond of the tear-away corners at first, I’ve grown to appreciate their utility over the ribbon bookmark found in some planners lines, which, at least in my case, becomes a delicious temptation for the cats whenever my back is turned. 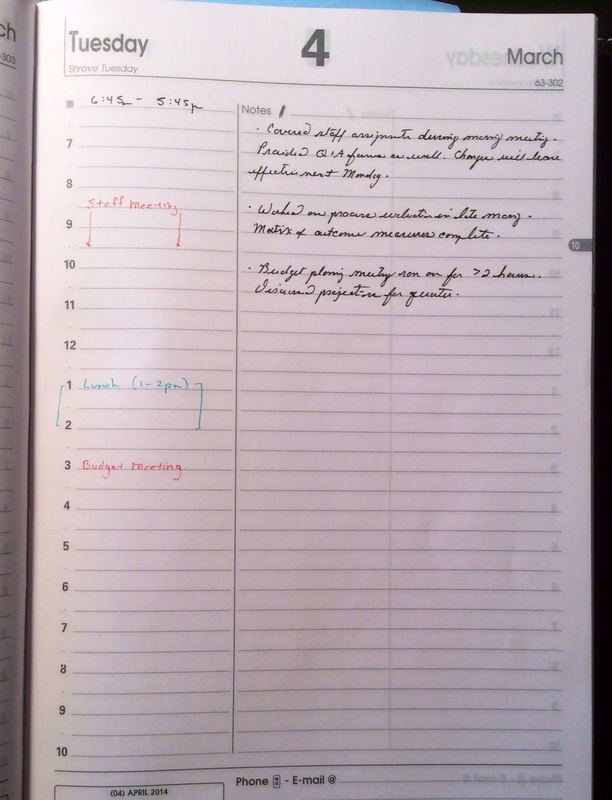 An example of how I use the ABP1- a useful combination of timed schedule and notes sections. Above is a shot of the ABP1 in action. Again, very practical with appointments and other scheduled events appearing in the timed column to the left and general notations about key events of the day appearing in the generous notes section to the right. One of the nice things about the timed column to the left is the extended range of hours. Perfect for weary souls such as myself who report to work early and often stay well into the evening. 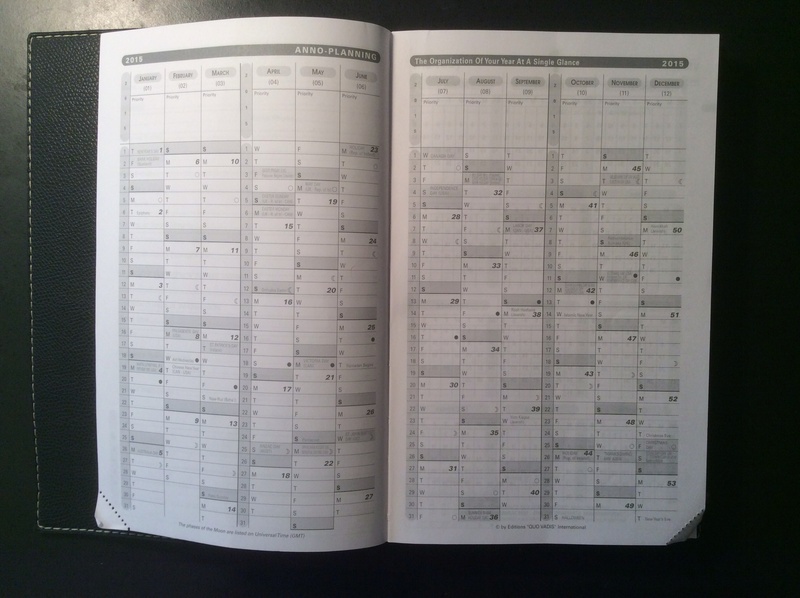 The only drawback of the ABP1 (albeit a minor one) is the absence of large monthly calendars, which would be a useful inclusion when a broader planning view is needed such as occurs with project management. While this would be a nice addition, it’s not essential and doesn’t detract at all from an otherwise excellent planner.